On behalf of His Holiness Pope Francis, the Apostolic Nuncio to the Arabian Peninsula, His Grace Archbishop Petar Rajič presented the Papal "Cross of Honor" to Mr. Lawrence Simon D'Souza and Mr. Valerian Maxim D'sa for their unique and distinguished service to the Church. 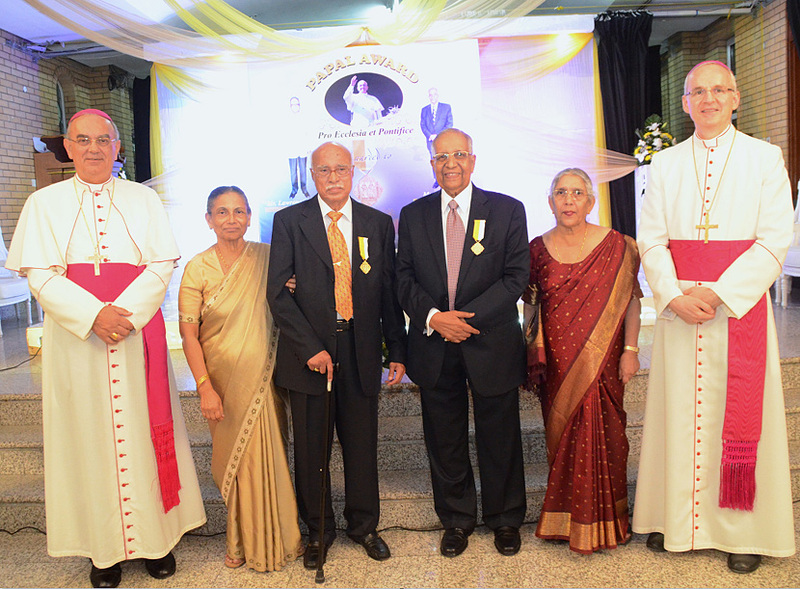 The awards were conferred in a special ceremony on November 27, 2014 at the Holy Family Cathedral premises in Kuwait City, in the presence of the Apostolic Vicar of Northern Arabia, His Lordship Bishop Camillo Ballin MCCJ, the Clergy, the Apostolic Carmel and Rosary Sisters, and the families and friends of the recipients. 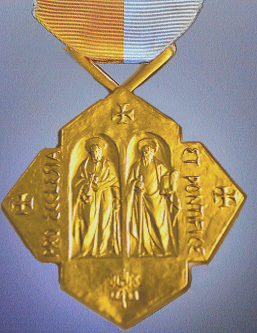 Pictured on the right, the medal, awarded in gold, is officially known as "Pro Ecclesia et Pontifice" (literally "For the Church and the Pope"). 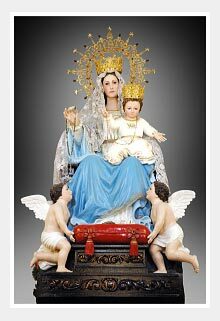 It is one of the highest honors that the Pope can bestow upon the laity and religious. The obverse depicts the Apostles Saint Peter and Saint Paul. On the left arm of the cross is the inscription Pro Ecclesia, on the right arm of the cross is Et Pontifice. At the point of the bottom arm of the cross is the coat of arms of the Pope. At the points of the other arms are small Greek crosses. 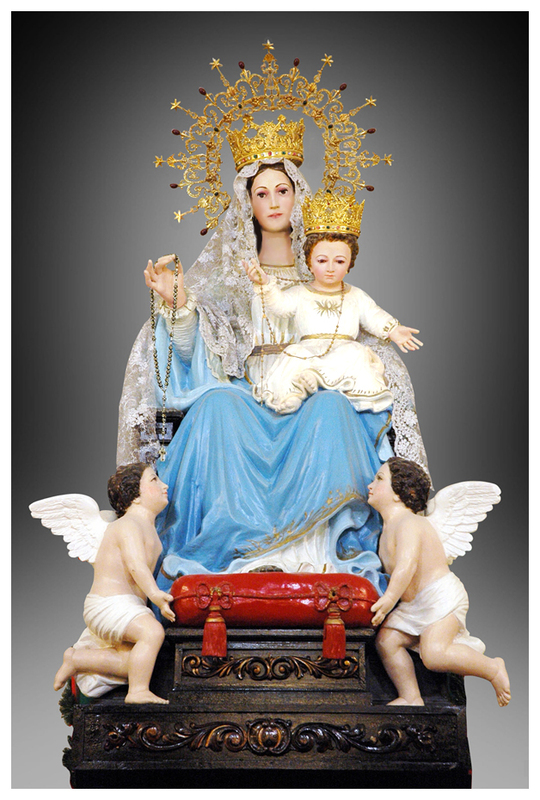 As part of the observance of the "Year of the Church" in the Apostolic Vicariate of Northern Arabia, H.L. 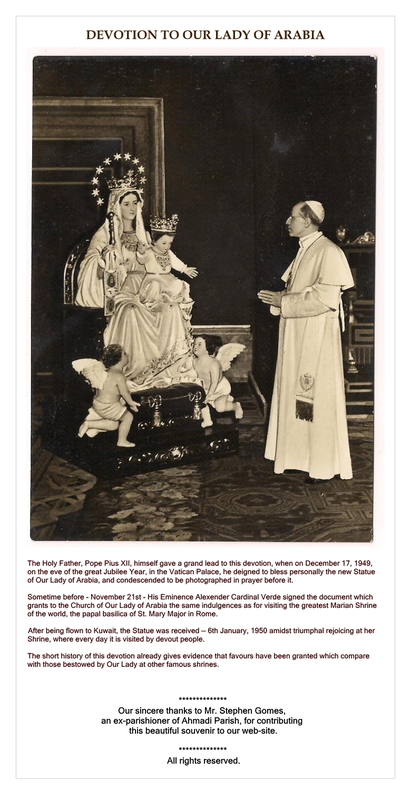 Bishop Camillo petitioned the Holy See to bestow the Papal Honor upon Mr. D'Souza and Mr. D'sa, both parishioners of Kuwait, "In recognition of their distinguished service to the Church of Kuwait, the Clergy and Catholic Community." The conferral of this Honor is also a meaningful way in which the Bishop has thanked them for their witness to Christ in the practice of their faith. Mr. Lawrence D’Souza and Mr. Valerian D’sa have notably supported the Church in every way possible for many years. They are both successful and prominent businessmen in Kuwait, who, as patrons of several charitable organizations, have used their wealth and talents to build up the local community. They are both admired for their humble and simple lifestyle and above all, for their concern for the poor. Golden Jubilarians - Mr. Lawrence and Mrs. Annie D'Souza are loving parents to 3 sons and a daughter. Mr. Valerian D’Sa and his wife Louisa, currently in their 64th year of blessed married life, are devoted parents to seven children: five daughters and two sons. The Catholic Community of Kuwait conveys its hearty congratulations and prayerful wishes to the Papal Awardees and prays that the Lord may continue to abundantly bless them and their families with the best of health, joy and prosperity!